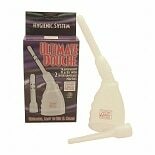 Shop California Exotic Novelties Ultimate Douche (1 ea. )1 ea. Shop California Exotic Novelties Berman Athena - Box (1 ea. )1 ea. $699$6 and 99 cents$1.17 / oz.